Prevent toner cracking and unattractive fold lines on documents with the Duplo DC-445 Paper Creaser. A simple and affordable finishing solution no digital printer should do without, the DC-445 creases a wide range of applications at up to 50 sheets per minute. Creasing digitally-printed output prior to folding ensures a clean, professional finish and makes it easier for folding devices to bend with accuracy. The DC-445 applies up to 15 creases in a single pass with great precision and is perfect for creating unique accordion applications and other color documents that require a fold right along the color break. Fully automatic and easy to use, the DC-445 is ideal for finishing short-run offset and digital applications including greeting cards, postcards, brochures, book covers, and more! 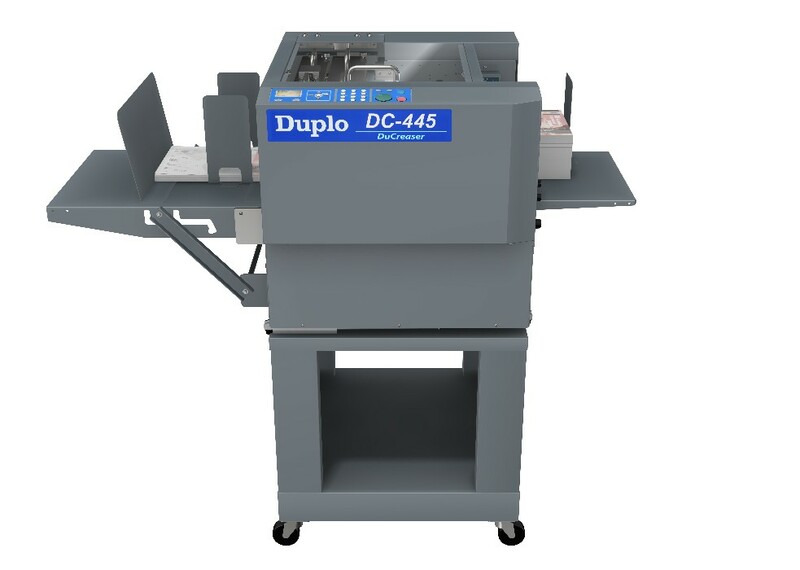 The DC-445 can also be configured with an in-line knife folder, enabling users to crease and fold pieces in a single pass. Please refer to the Integrated Folding System page for more information.